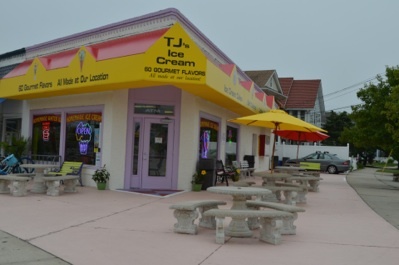 TJ’s Ice Cream Plus is the home of 60 flavors of the most delicious premium ice cream at the Jersey Shore. We have been happily serving families and friends for the past 20 years. All of our products are made at our location and specially crafted for the dessert lover, like ourselves. We not only have all the classic flavors, but many unique flavors developed by our top chef Marla Pino. She is a graduate of Johnson and Wales University and attended the Penn State Ice Cream Course. Marla is very hands on and available at all times around the store. Tj’s is a full service Ice Cream Parlor. We are available for private parties in our store or a location of your choice. Along with our large selection of Ice Creams, we also offer Italian Water Ice, Sherbet, and Soy based products. We also have soft ice cream and many other desserts all made by Marla. We hand dip every thing to order for our customer. In our colorful store you can get a cone, cup, pint or quart or really get creative and make your own sundae, waffle, milkshake or flurry! We have over thirty different toppings to add to your favorite ice cream flavor. We also have many different specialty cones and make our own waffle cones on the premise. Click here to watch our 20th Anniversary Music Video starring Marla, Ronny and the TJ’s Staff.